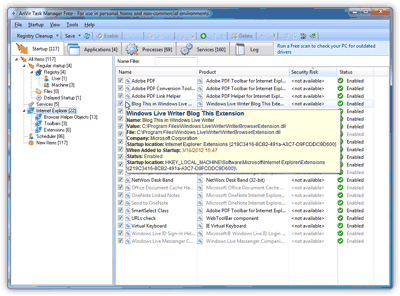 AnVir Task Manager Free is a free program for managing Windows startup, services and process. The program includes tools that give you the power to control the programs running on your system. To do so, this utility provides detailed information of each process and applications running automatically on Windows startup, running processes, running/stopped service including hidden programs. AnVir Task Manager free is a good replacement tool of Windows’ default Task Manager. This tool has more features and is more powerful then the Windows’. The program definitely takes good care of your PC, allowing you to see everything that is happening all the time. It’s always looking for threats (and potential threats), not allowing malicious programs affect your PC. The use of it is very easy, the program be divided into several tabs on the screen. Several options appear when you click on any program / process / service that is listed. It may be more complicated for laymen, but nothing a bit of use does not create a true custom. After all, it is an extremely complete alternative to the process manager that comes with Windows. It's a great program to leave with your Anti-Virus, since protection is never enough. During installation, it will try to download and install another tool (not required for this one) called Reg Organizer. Uncheck this option to prevent unnecessary installation. By the end of installation, it will again try to install a browser toolbar called SweetIM. Click on Decline to prevent it too. After running, the program will begin to analyze all programs on your start menu, currently running apps, processer and services. The main functions are divided into tabs. The first tab is marked as Startup where you'll find all the programs that start with Windows. The program will automatically detect if any of them is a spyware, adware or malware, checking certificates and querying databases. The second tab Applications displays all applications whose are opened currently. Clicking the right button, you can get information, hide the window, creating a floating icon on the desktop, bringing forward and minimize. To finish it, choose End Task (or press del). Then the Processes tab shows all running processes in real time. It also shows the level of CPU being used by the program, some memory and process information. Clicking the right mouse button, you can set a different priority, start a new process, close the selected process, block (leaving it in quarantine), restart the process, examine with VirusTotal and search the web about it. From the Services tab you will see all services that are being executed by Windows. You can enable or disable any of them, just by clicking the right mouse button. The Log tab finally shows details about everything that happened lately. Here you have reports on procedures performed, completed, various alerts and other notifications can investigate if something goes wrong on your computer. The program always displays at the bottom of your interface using the processor (CPU), the hard drive, memory and connection. So you can know how many and which resources are being consumed at the time. In addition, the program has an icon in the system that fills or empties as your processor is used. If you click this icon, it will update every second, informing the current processor usage, and which programs are consuming it. Great for testing and to know which is the one program that has left your PC so slow. Another interesting feature is that when any application is added to the Windows startup, you receive an alert. You can also prevent certain programs from being added to this list. You are also notified when your Internet Explorer home page is changed. After all, AnVir Task Manager Free is a brilliant freeware tool to manage your system easily with an advanced version of Windows’ default task manager. AnVir Task Manager Free works on Windows XP, Windows Vista, Windows 7 and we also tested it successfully in Windows 8 Consumer Preview.